YOU CAN HAVE THE BEST BEACH CEREMONY POSSIBLE! Royal Beach Weddings is here to help make your dream wedding possible. Your Destin beach wedding ceremony should also be an expression of worship, reflecting joy, celebration, community, respect, dignity and love. For more information, please contact us. Here's our general guide for wedding ceremonies. The sequence of events and ceremony timeline are listed below along with our typical script. Your wedding ceremony should also be an expression of worship, reflecting joy, celebration, community, respect, dignity and love. The Bible gives no specific pattern or order of service to define exactly what should be included, so there is room for your creativity. A primary goal should be to give each guest a clear impression that you, as a couple, have made a solemn, eternal covenant with each other before God. Your wedding ceremony should be a testimony of your lives before God, demonstrating your Christian witness. You may write your own personal wedding vows if you'd like. Couples also on occasion ask for specific scripture readings or poems to be read. These certainly can be accommodated, provided the material is appropriate and has been reviewed by us prior to the ceremony. Dear friends and family, with great affection for David and Kim we have gathered here to witness and bless their union in marriage. To this sacred moment they bring the fullness of their hearts as a treasure and a gift from God to share with one another. They bring the dreams which bind them together in an eternal commitment. They bring their gifts and talents, their unique personalities and spirits, which God will unite together into one being as they build their life together. We rejoice with them in thankfulness to the Lord for creating this union of hearts, built on friendship, respect and love. Our Father, love has been Your richest and greatest gift to the world. Love between a man and woman which matures into marriage is one of Your most beautiful types of love. Today we celebrate that love. May your blessing be on this wedding service, Father, I pray you’d protect guide and bless David and Kim in their marriage. Surround them, and us, with Your love now and always. Amen. Let me charge both of you to remember that your future happiness is to be found in mutual consideration, patience, kindness and affection. David it is your duty to love Kim as yourself, to provide tender leadership and protect her from danger. Kim it is your duty to treat David with respect, to support him and create a healthy and happy home. It is the duty of both of you to find the greatest joy in the company of the other and to remember that both in interest and affection, your are to become one and undivided. David and Kim, you have made a very serious and important decision in choosing to marry each other today. As I said, You are entering into a sacred covenant as life partners in God. The quality of your marriage will reflect what you put into nurturing this relationship. You have the opportunity to go forward from this day to create a faithful, kind, and tender relationship. We bless you this day. It is up to you to keep the blessings flowing each and every day of your lives together, and we wish for you the wisdom and compassion, to create a peaceful sanctuary in which you can both grow in love. David, do you understand and accept this responsibility, and do you promise to do your very best each day to create a loving, healthy, and happy marriage? David: Yes, I do. Kim, do you understand and accept this responsibility, and do you promise to do your very best each day to create a loving, healthy, and happy marriage? Kim: Yes, I do. I, David, take you Kim, to be my wife, my partner in life, and one true love. I will cherish our union, I will trust you and respect you, Laugh with you and cry with you, love you faithfully, through good times and bad, through sickness and health, I give you my hand, my heart and my love, and I pledge to you my faithfulness, from this day forward, for as long as we both shall live. I, Kim, take you David, to be my husband, my partner in life, and one true love. I will cherish our union, I will trust you and respect you, Laugh with you and cry with you, love you faithfully, through good times and bad, through sickness and health, I give you my hand, my heart and my love, and I pledge to you my faithfulness, from this day forward, for as long as we both shall live. May I have the rings? Let us pray. Bless, O Lord, the giving and receiving of these rings. May David and Kim abide in Thy peace and grow in their knowledge of Your presence through their loving union. May the seamless circle of these rings become the symbol of their endless love and serve to remind them of the holy covenant they have entered into today to be faithful, loving and kind to each other. Dear God, may they live in Your grace and be forever true to this union. Amen. David, repeat after me. I give you this ring as a symbol of our vows, and with all that I am, and all that I have, I honor you. With this ring, I thee wed.
Kim, repeat after me. I give you this ring as a symbol of our vows, and with all that I am, and all that I have, I honor you. With this ring, I thee wed.
For as much as David and Kim have consented together in holy matrimony, and have witnessed the same before God and these witnesses, and have pledged their faithfulness each to the other, and have pledged the same by the giving and receiving each of a ring, by the authority vested in me as a minister of the gospel, and according to the laws of the State of Florida, what God has joined together today, let no man put asunder. David, you may now kiss your bride. Join with me as we ask God’s blessing on this new couple. Eternal father, redeemer, we now turn to You, and as the first act of this couple in their newly formed union, we ask You to protect their home. May they always turn to You for guidance, for strength, for provision and direction. May they glorify You in the choices they make and in all that they do. Use them to draw others to Yourself, and let them stand as a testimony to the world of Your faithfulness. We ask this in the name of our Lord, Jesus Christ, Amen. It is now my privilege to introduce to you for the first time, Mr. and Mrs. David Jones. 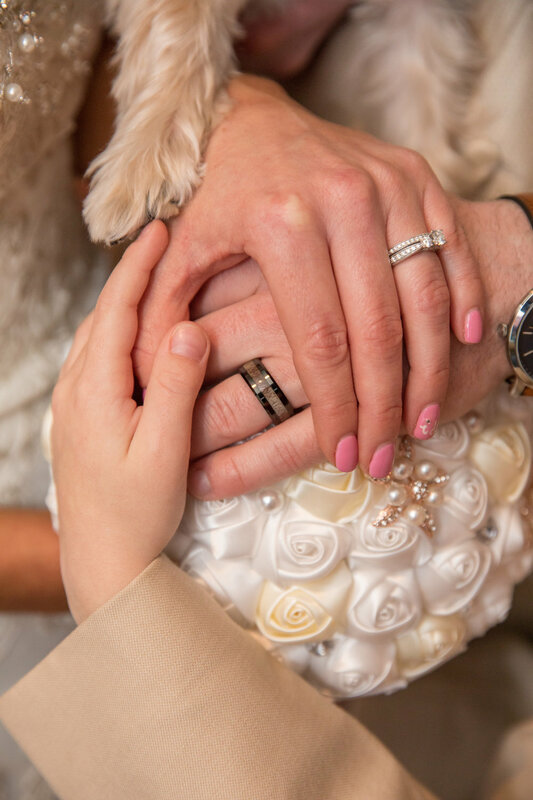 We do allow our Brides and Grooms to write their own vows if they'd like. You can add certain scripture readings to your ceremony as well. Sometimes, couple may even choose some special poetry or love story reading to be included. We do recommend that you keep to the above script as much as possible. Our ministers deliver this script very well because they are so familiar with it. This makes for a smooth and very natural feel to the conduct and flow of the wedding. Your thoughts are always welcome and our wedding ministers would be glad to discuss any wedding details with you. We truly hope each and every wedding becomes the memorable and romantic occasion our clients come to expect.